Our pet rabbit, which has been vaccinated has contracted myxy. I have taken it to the vets several times and have been given pain killers and antibiotics for any secondary infection. 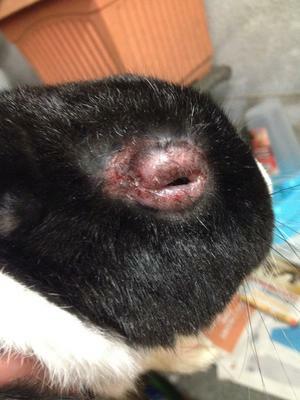 However this doesn't seem to have reduced the swelling on my rabbit's eye (picture attached). I'm not sure what to do whether to have the rabbit put down. He is still eating well and is lively and behaves normally. However I don't know how much pain he is in. The vet has said that he may survive, but others have told me I should have him put down. I wondered if anyone could give me some advice to help make that decision.